Its blue skies, palm trees, colonial architecture and tropical climate will seduce you, and the remarkably affordable cost of living and peaceful lifestyle will entice you to stay. With extensive infrastructure, safe investment, ease of access, an established expatriate community, Merida, capital of the Yucatan, has become one of the most attractive places for foreign property investment. 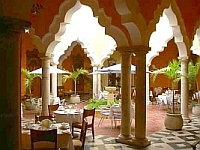 With a population of over 800,000, Merida, designated as the Cultural Capital of the Americas offers a cosmopolitan lifestyle with small town charm and friendliness. Whether you enjoy exploring Mayan ruins, a day a the beach or strolling along the European inspired boulevards, Merida and its surroundings have everything you could want including theatres, museums, libraries, universities, restaurants and markets. As one of the most beautiful and safest cities in Mexico, Merida has become a haven for foreign property investors looking to find a tranquil retreat to call home. From the grandeur of European style mansions, to the charming Spanish colonial homes , few places rival Merida in architectural variety and charm. 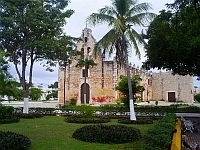 Founded in 1542 the city is home to the oldest Cathedral in the Americas situated in the heart of the city on the Plaza Grande. 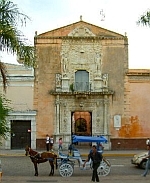 Throughout the week, the theaters, plazas and galleries offer countless events, including music, dance, theater, youth concerts, exhibitions and other special events related to the designation of Cultural Capital of the Americas Year 2006... all usually held within walking distance of the Plaza Grande which forms the heart of the historical center where most foreign investors have decided to purchase. This old colonial neighbourhood boasts French and Spanish colonial architecture and most homes have either central courtyards or gardens and the area is currently being transformed by the influx of American and European home owners. With real estate prices starting as low as $30,000.00 USD for a fixer-upper on the beach or in the city to upwards to 2 million for a classical mansion, Merida has something to offer to all investment portfolios. Construction prices are very reasonable, currently running below $50.00 USD per sq. ft. to build new or remodel. With its growing GDP, a higher level of foreign direct investment than any other Latin country, and a current political climate, investing in Mexico today offers high rewards with limited risk. The peso is strong and direct foreign investment is at an all-time high. In fact, in the past year the flow of foreign capital into the Mexican stock market rose more than 6%, helping make it the seventh best performing stock market in the world. In February of 2003, the Wall Street Journal published an article entitled Mexico Real Estate is a Haven for U.S. Institutional Investors. This enthusiasm has now overflowed to the private property investor. The property taxes are minuscule compared to the U.S. and Canada, usually costing just a few hundred dollars per year. It is also very easy to be exempted from paying the capital gains tax - you just have to prove that you reside in the property for at least six months. The appreciation in many areas, especially on the coasts, can be very high, with 50% or more per annum being a realistic number. And above all, buying Mexican real estate is safe and easy. Infrastructure and the standard of living are high. The Merida International Airport provides service to most Mexican and US destinations and connections to Europe. Local transportation is efficient and car rental very inexpensive. Wonderful clean beaches are less than a half hour's drive away and a variety of Mayan ruins and wildlife parks are within a short drive or bus trip from the city. The city is well served with wireless, cellular and high speed communications and internet capabilities. 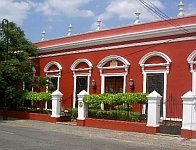 Healthcare in Merida is on par with the USA, Canada and Europe and many of the doctors are US trained. Many facilities are state of the art but costs are about 30% of those elsewhere. Here, in this sophisticated, safe cosmopolitan city you can own a beautiful historic home with garden and pool for a fraction of the cost you would be paying back home and enjoy a higher standard of living. So if you are looking for a wonderful lifestyle, a secure investment, and year round blue skies then purchasing a home in Merida may be the investment opportunity for you.